The Dutch have always had an unusual approach to the Lizard canary. I’ve never understood why. As a nation, the Dutch are accomplished bird breeders and very successful exhibitors. They have an international outlook and English is widely spoken, so they are well placed to appreciate the Lizard’s unique characteristics and traditions. The Lizard is a popular show bird in Holland, and the Lizarddag is one of the best Lizard canary shows in the world, yet, with a few notable exceptions, their birds lag behind those bred in Belgium and Italy. That’s not the fault of the breeders, but as we shall see, of the administrators. That was obvious when I first visited the Lizarddag in 1996. The Dutch show scale was unique: it awarded as many points for the rowings as it did for the spangles and cap combined (20 points). You can guess the result: their birds had an abundance of rowings but little else of merit. The best birds were quite good, being based on British blood stock, but the rest were poor. Fortunately, around the beginning of this century, the LCA/COM scale of points was adopted and things began to improve. Within a decade, the standard of birds on show at the Lizarddag was as good as, if not better than, the LCA Classic, although much of the credit goes to the Belgian exhibitors. Nevertheless, the overall standard of the Dutch Lizards has undoubtedly risen, but that may be about to change. 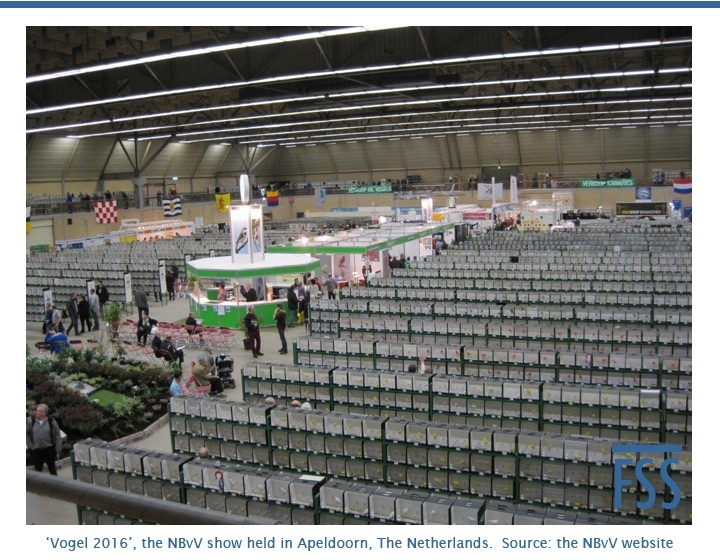 In January 2016, Pedro Leijen sent me the results of the NBvV show – the Dutch equivalent of the old National Exhibition of Cage & Aviary Birds (1). I searched for Best Gold and Best Silver Lizard, but there were no such awards: they had been amalgamated into ‘Best Yellow Ground Lizard’. It was only when I received the revised NBvV show classification from Marko Dielen that I understood. The NBvV classification (2) is now divided into three groups: white, yellow and red Lizards, but each group is treated differently. Let’s take a look. Gebroken cap means broken cap. Zonder cap means non cap. Lizard, as you might guess, means Lizard canary; it is not translated into Dutch. The first group is for ‘white Lizards’ (Lizard wit). Rather than providing classes for intensive and non-intensive feathered birds (which exist in white-ground canaries of all varieties), it is split into dominant white (wit dominant) and recessive white (wit). Next is the group of ‘yellow Lizards’ (Lizard geel). These are the traditonal Lizards split into gold (intensief) and silver (schimmel). Note that golds and silvers compete against each other for Best Yellow Lizard; there is no Best Gold and no Best Silver. If the Lizarddag is anything to go by, over 90% of the Lizard canaries will be competing in this group. Finally we have the group for ‘red Lizards’ (Lizard rood). To the best of my knowledge these are for colour-fed Lizards regardless of whether they are yellow-ground or red-ground birds (i.e. Lizards crossed with red canaries). There are only four classes in this group: three of them for golds (intensieve); only one for silvers (schimmel) and that is for clear caps only. A brave new world for the Lizard canary; or simply double-Dutch (3)? Other traditional British canary varieties are not subjected to this treatment: the Norwich and Yorkshire classes, for example, go from clear to self with no separate classes for white-ground or colour-fed specimens. Why is the Lizard treated differently? Unlike the Lizarddag, which is run by just three people who actually know something about Lizard canaries (4), the NBvV is a large bureaucracy. For canaries that are judged on their shape, size and/or crest, it generally follows British practice. Problems arise because the Lizard isn’t a type canary; it is a bird of pattern, and doesn’t fit neatly into the standard ‘posture canary’ format (5). The long term solution is for the Lizard to be classified in a section of its own, along with the London Fancy if/when it is officially recognised. Until then, the Lizard will continue to be treated as a misfit; a square peg in a round hole. Unfortunately, there is no Dutch equivalent of the Lizard Canary Association to represent the breed at national level. I don’t know why anyone thought that a change to the classification was necessary, but the influence of colour canary section is all too apparent. Why stop there? Pandora’s box has been opened. Will other colour mutations be on the agenda in future? NBvV stands for the Nederlandse Bond van Vogel Liefhebbers (the Dutch Union of Bird Keepers). It is a huge organisation with around 32,000 members. Its annual show held in Apeldoorn every January is a fantastic event, attracting around 13,000 exhibits in 2016. The new NBvV classification is fixed from 2015-19 inclusive. For the benefit of my readers who do not speak English as their first language, let me explain that ‘double-Dutch’ refers to someone who is speaking gibberish or nonsense. Fortunately the Lizarddag is not affiliated to either the NBvV or COM, and sets its own classification. The same applies to COM shows. A very interesting but sad state of affairs Huw . (open ) question…..why do the Lizard guys in Holland not get together to form their own association so they have a voice………or untill then boycott the show under this dreadfull classification ? as for the RED section i do hope its for colour fed birds but suspect fanciers are already crossing red into their strains to try and improve their redness…..which will fail. I’ll be asking that question when I go to Keijenborg in October!